We have spoken before of "synthesis" in the liturgical arts; those moments when everything seems to come together and work in harmony rather like Renaissance counterpoint: the text and ceremonies of an ancient rite, the beauty of the vestments, altar and church, the sacred music and even the lighting and illumination present in the church at a given hour. It is in moments such as these that the full, seductive power of the liturgy and liturgical arts are made particularly manifest to even the most ardent skeptic (or driest academic theologian). It is then that, as Dom Gerard Calvet, OSB has said, "[the sacred liturgy] opens to the small and the great alike the treasures of its magnificence." 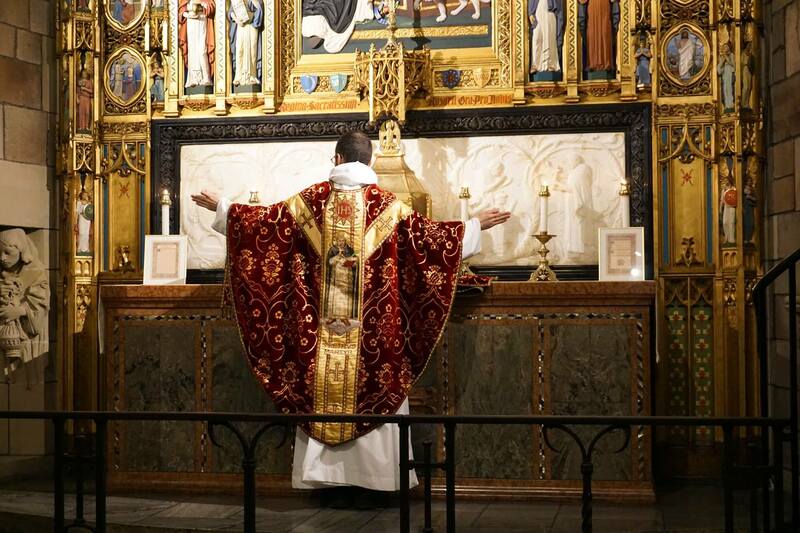 It is then especially that "the liturgy exercises a truly seductive influence on souls." 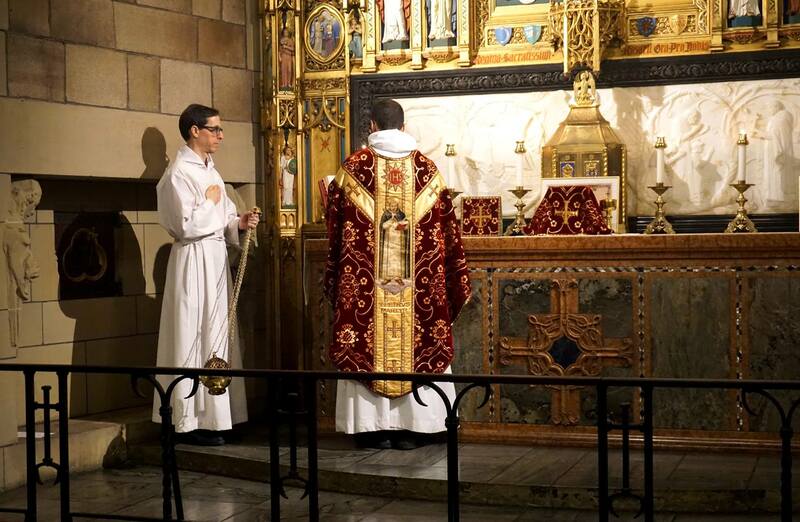 I like to show these moments when I come across them for they are instructive of the power of the sacred liturgy and the importance of the liturgical arts -- which, as obvious as that might seem to many of us, is an oft forgotten, sometimes even doubted point. 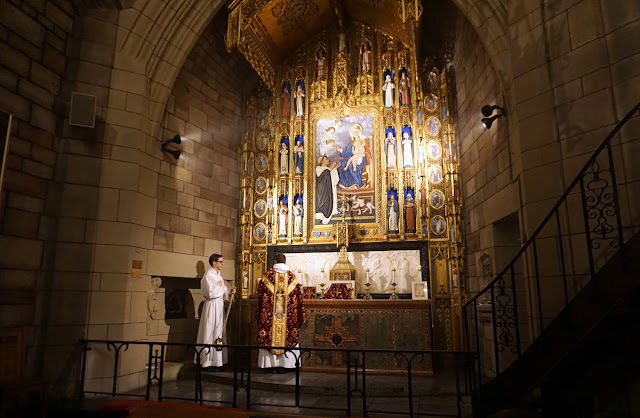 Another example of this wonderful of harmony of elements came to my attention recently in the form of a Dominican Rite Mass offered this past January at the Rosary altar of the Church of St. Vincent Ferrer in New York City for the New York Purgatorial Society. Unfortunately I was unable to dig up any historical specifics on the works shown here in time for this particular article, but I would still like to offer some thoughts nonetheless (and we will quite likely circle back to this church in more detail in another article anyway). 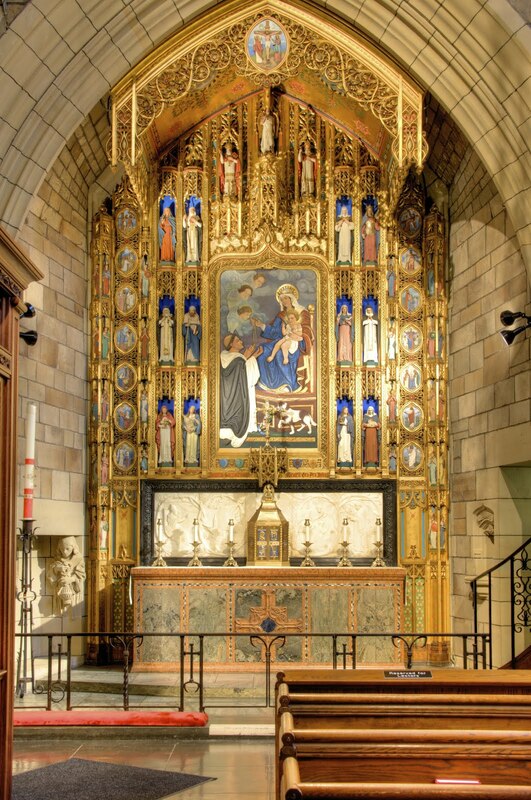 The church was itself designed by the American architect, Bertram Goodhue, and as such he may also be responsible for altar and reredos shown here. 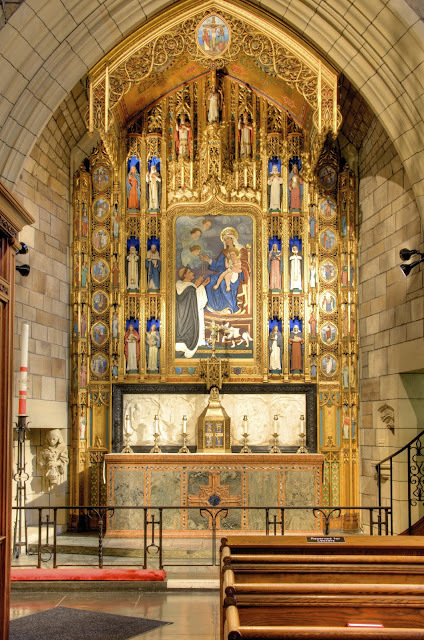 That reredos is gold gilt, making the painted scenes and figures particularly vibrant -- without being garish -- while also making the altar itself shine rather like a jewel amidst the gothic revival stones and arches that surround it. A study in effective contrasts. The primary image on the reredos depicts the Blessed Virgin Mary giving the rosary to St. Dominic and painted medallions show the fifteen traditional mysteries of the Rosary -- the crucifixion itself being on the canopy above the altar -- which is also effective symbolic placement for an altar piece where the sacrifice of the Cross is renewed. 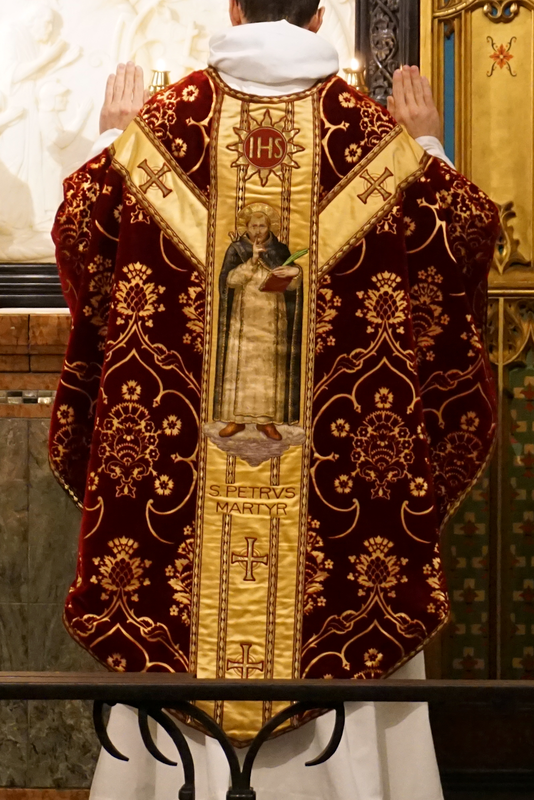 The chasuble worn by our Dominican celebrant, Fr. Sebastian White, O.P., is a good example of what gothic revival can be and arguably ought to be. It certainly hearkens back to the earlier roots of the gothic revival and also to the middle ages. The orphrey design is unique inasmuch as the central orphrey is wider than the other parts, but it certainly works and includes an image of the Dominican, St. Peter Martyr (St. Peter of Verona). The textile is of the sort that is often associated by many people with the baroque era but what many may not realize is that it is also faithful to many extant examples we have from the middle ages. The patterns and textures all combine in a complementary way, providing enough ornament to maintain visual interest but without the various elements competing with one another in a negative way. The key here seems to lie in the fact that the repeating pattern is large enough that it is not busy, letting the red (what would appear to be) velvet set the dominant note, while the gold patterns compliment the orphreys perfectly. The orphreys in turn include red details that harmonize back with the greater chasuble. The facing of the altar is set in beautifully coloured marbles with luminescent, mosaic details bordering the larger green and amber marble pieces. In the middle is a sculpted cross with black marble set in the axis. The design of cross and panels gives it something of the look of an antependium, while the use of coloured marbles is appealing because it both adds visual richness and a sense of texture. 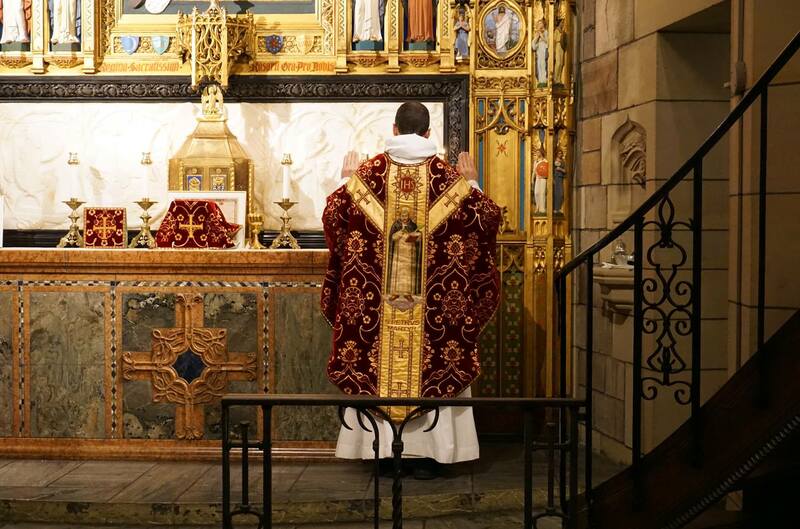 The ancient liturgical rites and ceremonies of the Church have a majesty that is the fruit of centuries upon centuries of organic liturgical development. There is a gravitas to those rites on the one hand, and a foretaste of the heavenly liturgy on the other. It is no small wonder then that so many artists and figures, Catholic and otherwise, were inspired to appeal Paul VI for their preservation in the early 1970's. When we look at examples such as these, what lesson should we try to take from them? 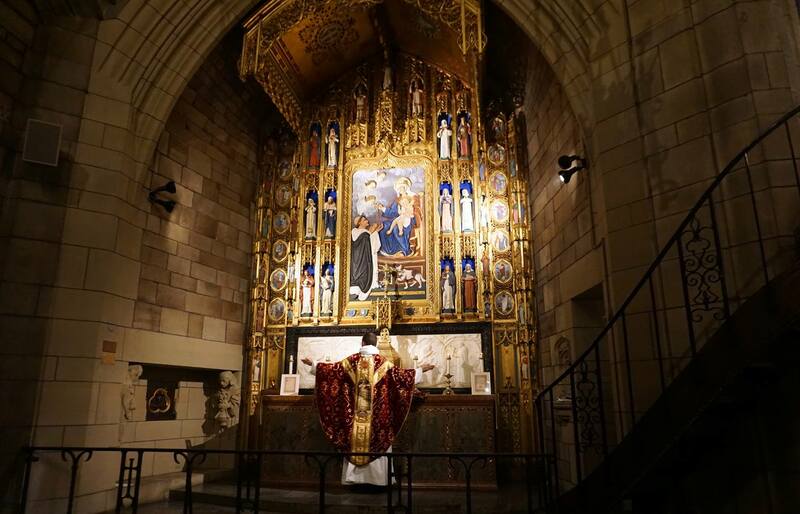 I believe it is just this: that as we consider liturgical arts projects in our churches and chapels, we should consider the whole as much as we consider the part. Rather than approach each item as a purely autonomous item, when we consider the vestments we might commission for a church, or how we might re-enchant the sanctuary, we should consider how we might bring about this sort of synthesis. How can the parts form the part of a greater, harmonious whole? This is no small task of course. It won't be accomplished overnight. But it won't be accomplished at all if we never stop to think about it. Given the evangelical power this sort of thing has, it surely seems worth the effort. "The Church in her impenetrable mystery as the bride of Christ, the Kyrios of Glory, has need of an earthly epiphany.. accessible to all: this is the majesty of her temples, the splendour of her liturgy and the sweetness of her chants."